Home > Misc > Grooming Products > Dental > PetAlive Gumz-n-Teeth for Dogs & Cats - 60 ct.
Gumz-n-Teeth promotes healthy gums in dogs and cats and helps to prevent gum problems such as gingivitis, swollen and bleeding gums. Gumz-n-Teeth by PetAlive helps to prevent gingivitis, inflamed swollen gums and tooth decay in dogs and cats. 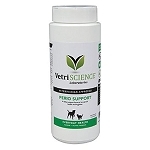 Plus, its herbal and homeopathic ingredients promote healthy gums and teeth in pets. To strengthen bones and teeth and prevent decay. This product significantly reduced the bad breath in my 11 year old Fiest mix dog. She has gingivitis and I cannot brush her teeth because her gums bleed. Her breath is much better since taking this supplement for about a month. Gumz-n-Teeth is a 100% safe and natural combination of herbal and homeopathic ingredients in an internal formula for preventing gingivitis (gum disease) and tooth decay as well as improving general dental health in pets. Spirulina (Arthrospira platenis) is a single celled micro-organism found in the sea and known to be an excellent source of chlorophyll. Widely used for its nutritive properties, Spirulina contains high concentrations of protein, vitamins (including B12 and folic acid) and carotenoids. Spirulina also makes vitamin A available for use in the body. Vitamin A is essential for healthy eyes, teeth and immune functioning. This sea algae has been medicinally used in Chinese medicine for thousands of years to improve resistance to disease and general systemic health. Horsetail (Equisetum arvense) has been widely used in Western and Chinese herbalism for many centuries. This medicinal herb is an effective tissue healer due to its high silica content. Silica is essential in the maintenance of healthy and strong teeth, skin, bones, claws and fur and is the main component in all connective body tissues including the myelin sheaths around nerve cells and the membranes of the brain and spinal cord. Dandelion (Taraxacum officinale) Dandelion is a rich source of vitamins and minerals, including Vitamin A, D, C, various B Vitamins, iron, lecithin, silicon, potassium, magnesium, zinc and manganese. These vitamins and minerals are all essential for the health of the digestive system, bones, teeth and gums. Silica (6c) is also known as the 'homeopathic surgeon' due to its unique ability to cleanse the cells of toxins and rid the body of bad odors. Silica is naturally occurring in the body, especially in hair, nails, skin, nerve sheaths and all mucous membranes, including the mouth and digestive tract. This biochemic tissue salt is also frequently prescribed for gum disease (including gum boils and mouth abscess), mouth ulcers and chronic mucous infections. Silica acts as a natural cleanser and purifier and will also eliminate all foreign matter in the body. For this reason Silica should not be used for pets with any type of prosthesis, metal plates, pins or artificial tubes in the body. Calc. Fluor. (6C) (Calcium fluoride) is a biochemic tissue salt which is important for teeth, skin and bones. Calc. Fluor. is also useful for teething pain and toothaches. It is found in the enamel of teeth and bone surfaces and is excellent for maintaining the health and integrity of teeth. Calc. Phos. (6C) is also a biochemic tissue salt useful for healthy teeth and gums and is particularly important in times of growth and development. This salt is found in the bones, connective tissue, teeth etc. and is necessary for providing the strength/solidity of these tissues. Calc Phos. is excellent for improving circulation, bones and teeth. Capsules may be swallowed whole or opened and mixed with a little food. Regular use will promote strength of teeth and gums and general improvement in dental health. You should begin to notice an improvement in appearance of teeth and gums as well as breath within 3-6 weeks of regular use. For more information, visit our webpage - Dental Disease in Dogs and Cats.